潘晓炀, 杨林莘, 王晓燕, 金银哲, 程裕东. 冻融循环对南极磷虾虾肉糜滋味成分的影响[J]. 渔业科学进展, 2019, 40(2): 155-160. DOI: 10.19663/j.issn2095-9869.20180810005. PAN Xiaoyang, YANG Linxin, WANG Xiaoyan, JIN Yinzhe, CHENG Yudong. Effects of Freezing and Thawing Cycles on Taste Components of Minced Antarctic Krill[J]. Progress in Fishery Sciences, 2019, 40(2): 155-160. DOI: 10.19663/j.issn2095-9869.20180810005. Corresponding author: JIN Yinzhe. E-mail:yzjin@shou.edu.cn. Abstract: Antarctic krill (Euphausia superba) stocks produce large biomasses and contain useful, high-quality proteins. Krill protein has been suggested to be a good source of protein for humans, due to its well-balanced amino acid composition and high biological value. In this study, minced Antarctic krill was studied. The effects of freezing and thawing cycles on changes in the content of adenosine triphosphate (ATP) and related compounds and free amino acids in minced Antarctic krill were investigated. Changes in taste components during freezing and thawing cycles were also analyzed. Results showed that with increasing freezing and thawing cycle times, the degradation of ATP and related compounds increased rapidly, the content of umami nucleotides gradually decreased, and the content of bitter nucleotides gradually increased. 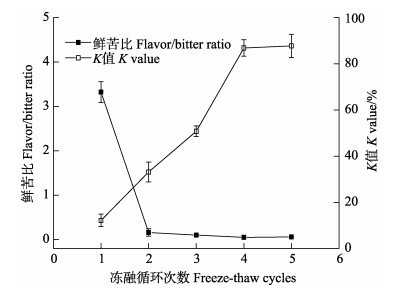 The flavor/bitter ratio was 3.32 at the first freeze-thaw cycle, and then after two freeze-thaw cycles the flavor/bitter ratio decreased significantly (P < 0.05). At the same time, the K value increased rapidly, which indicated that the freshness had dropped sharply. After a third freeze-thaw cycle, the K value increased significantly (P < 0.05). The K value was (86.88±3.58)% at the fourth freeze-thaw cycle, meaning that the minced Antarctic krill was no longer fresh. After the fourth freeze-thaw cycle, the K value did not significantly change. 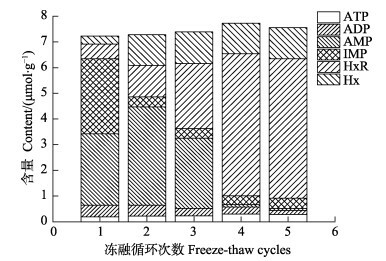 The total content of free amino acids increased as the number of freeze-thaw cycles increased. However, the proportional content of umami amino acids and sweet amino acids decreased, while that of bitter amino acids gradually increased. The total taste activity value of bitter amino acids was the highest during the freeze-thaw cycles, which indicated that bitter amino acids made the greatest contribution to the resultant taste. This led to the further deterioration of the taste components of minced Antarctic krill. Therefore, it was concluded that the number of freeze-thaw cycles should be controlled to be within two to better preserve the flavor of minced Antarctic krill.